Third-party fundraising websites lose charities relationships, data and money. UCL Philosophy graduate Chester Mojay-Sinclare created technology to put the control back in the hands of good causes. UCL Philosophy graduate Chester Mojay-Sinclare spent all his spare time at university taking part in entrepreneurship challenges, winning multiple competitions and awards in the process. After gaining funding, advice and inspiration from experts at UCL Innovation & Enterprise, he launched a fundraising website during his second year at university, to help people find charities they would like to donate to. Through this venture, he learned there were a number of limitations for charities when using third-party websites such as JustGiving to fundraise and collect donations. In particular, charities don’t own the data on their donors, so they aren’t able to establish meaningful and long-term relationships with those who give to charity. 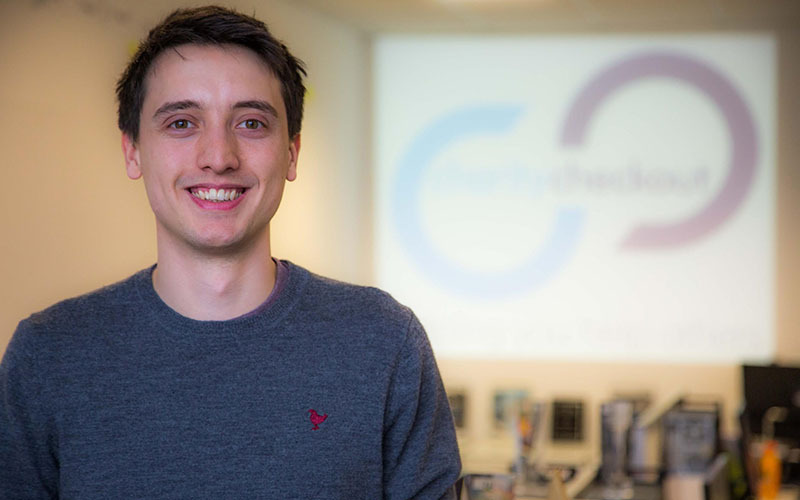 As soon as he graduated, Chester subsequently focused on building technology for charities to fundraise through their own websites and under their own brands. Meeting his business partner through UCL Innovation & Enterprise and his first investors through the UCL Alumni Network, Chester had the foundations in place to revolutionise the online fundraising sector. Charity Checkout is a tech for good business that is challenging the status quo in online fundraising. Since the early 2000s when charity donations moved from paper format to the first third-party fundraising websites, nothing much evolved in the sector. Chester commissioned some research on the nature of donor relationships with charities when they donate via third-party websites. Incredibly, the research revealed that 46% of people didn’t remember which charity they gave to when they last sponsored a friend online. In effect, donors have a relationship with the platform they donate via and the friend they are sponsoring, while the charity itself becomes overshadowed. Charity Checkout is the next and much-needed evolution in the online fundraising market. It marks a move away from third-party platforms and puts the control back in the hands of charities. As a result, charities own relationships and data with donors, while all transactions occur solely under their brand. Ultimately, Charity Checkout has proven this approach raises more money for charities than third-party websites do. Since Charity Checkout launched in 2012, the platform has raised more than £25 million for charities. In the last two financial years, revenue growth has increased three times over, while millions of pounds are now being raised for charities each and every month. Chester’s team has expanded to 30 people and the company is broadening its customer base, providing technology at the enterprise end of the market to the UK’s biggest charities, as well as supplying fundraising technology to corporations. Charity Checkout’s next goal is to raise £100 million a year for charity – which the company is on-target to achieve by 2020.